This new deco buoy was created by Philippe Balan, Technical Director of the diving center and developed during the drifting dives carried out here in the Atlantic. Despite the precautions taken by the divers, nobody is safe from a technical incident or an over consumption related to a particular context. 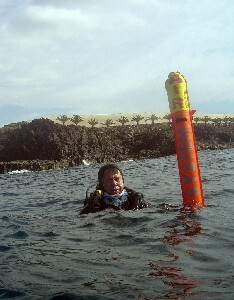 In the event of swell, the signals of assistance to claim a bottle are not obvious to understand and it is better to use a signal clearly visible above surface. As for the divers who embark with 2 deco buoys, a yellow and an orange or red, they will be certainly happy of being able to lighten one. 1m15 of overall length, (95 cm orange, 30 cm yellow) and 20 cm width, it is very solid because of the matter used for its manufacture which is cloth-lined PVC. Let us recall that the yellow color is related to an emergency (general European protocols). 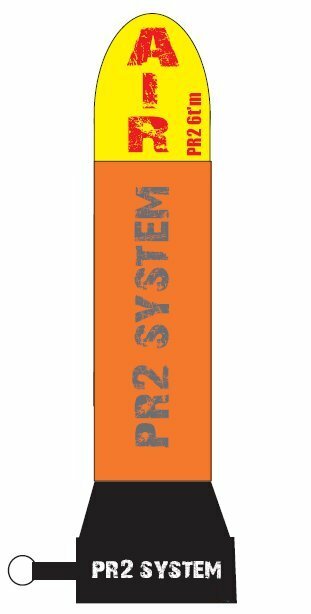 CAUTION: There are some diving shops which are selling false deco buoy labelled PR2 SYSTEM but with only one part orange. It is not the deco buoy that we patented ! For sale in our dive center and in all the diving stores in Paris and parisian suburbs, Marseille and Lyon. 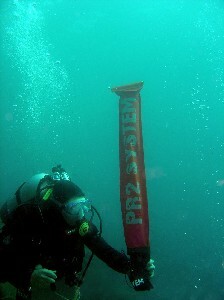 The decompression buoy PR2 SYSTEM is designed for divers' safety needs: it marks divers position during their decompression steps in such a manner that the safety boat can even locate them in case of drift dive. 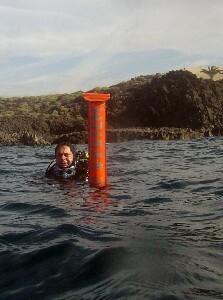 The divers use the first orange part of the buoy. Additionally, in case of a lack of air, our system is the only one that allows the pilot of the boat to see divers' alert launch. 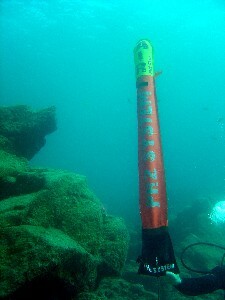 The divers use the second yellow part of the same buoy . 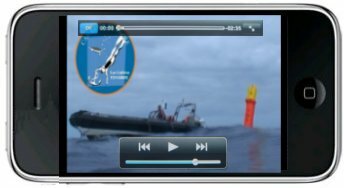 As soon as the pilot sees the yellow top of the buoy, lebelled "AIR", he will understand that the diver needs assistance and quickly supply a spare full tank of air. Click on the triangle to start the video.